Story: When Alma Sofia Esperanza José Pura Candela asks her father why her name is so long, she is treated to the magnificent story of her family's history. With each family member, from grandmothers and a great-grandmother, to grandfather and great-aunt, Alma learns something special about each person and why they were important to her father. Best of all, as Alma listens, she recognizes the ways in which she is like her namesakes and claims each name. Learning that her great-grandmother Esperanza had hoped to travel the world but never left the city she was born in, instead charting the travels of her sailor son, Alma declares, "The world is so big! I want to see it, Daddy. You and me together. I am Esperanza." Finally, she asks where the name Alma came from. Her father tells her, "I picked Alma just for you. You are the first and only Alma. You will make your own story." 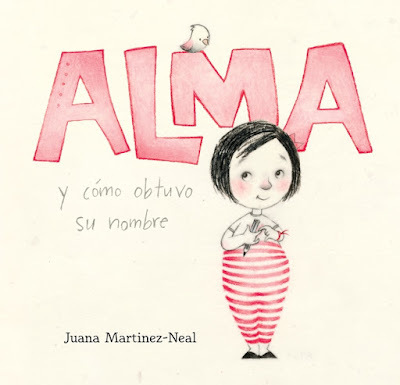 Pictures: Martinez-Neal's illustrations for Alma and How She Got Her Name is magical, starting with the mottled, creamy pages. Softly shaded drawings are highlighted with red, pink and a wonderful steel blue. 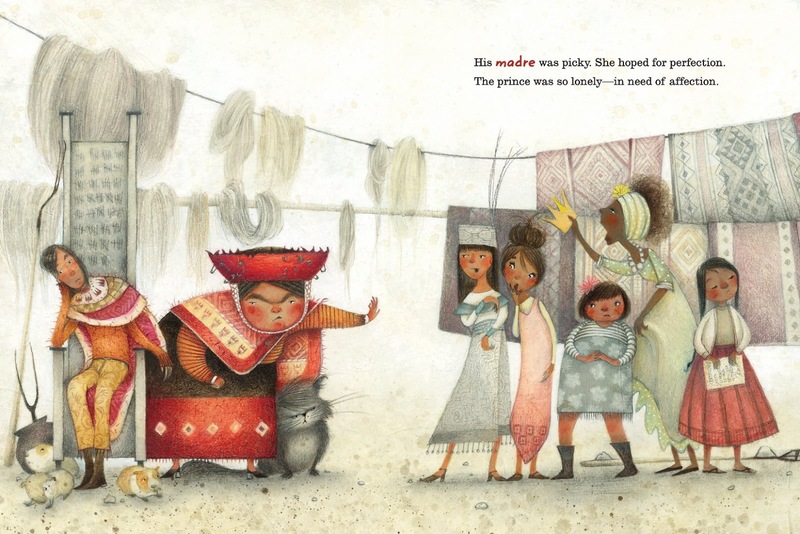 While Martinez-Neal leaves some pages sparsely illustrated, others are filled with detail, from Alma's toys and art to the rich imaginings of the lives of her namesakes. Close reading will also reveal little details from Martinez-Neal's birthplace, Peru. Why Read? Why Buy? : Alma and How She Got Her Name is one of the most beautiful picture books I've read this year. It is also special in that it is about tradition and family history. I love names and take the naming of something - from my own children to my pets - very seriously, so a book about a person with as many names as a British royal and the meanings behind all these names is especially meaningful to me. 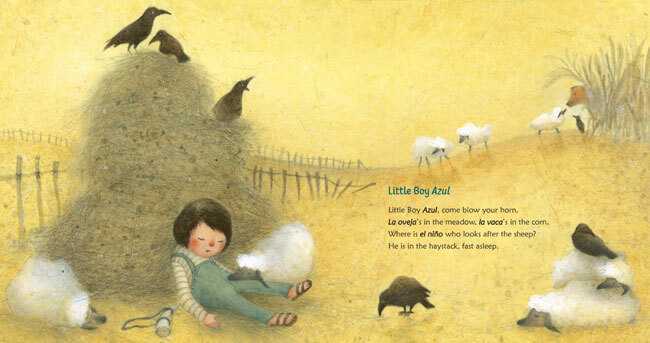 In a note from the author, she explains how she got her name, which is Juana Carlota Martinez Pizarro, inviting readers to seek out the stories of their names. 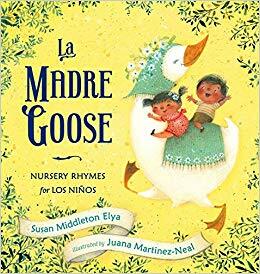 La Madre Goose: Nursery Rhymes for Los Niños takes traditional Wester nursery rhymes, adding Latinx flair. 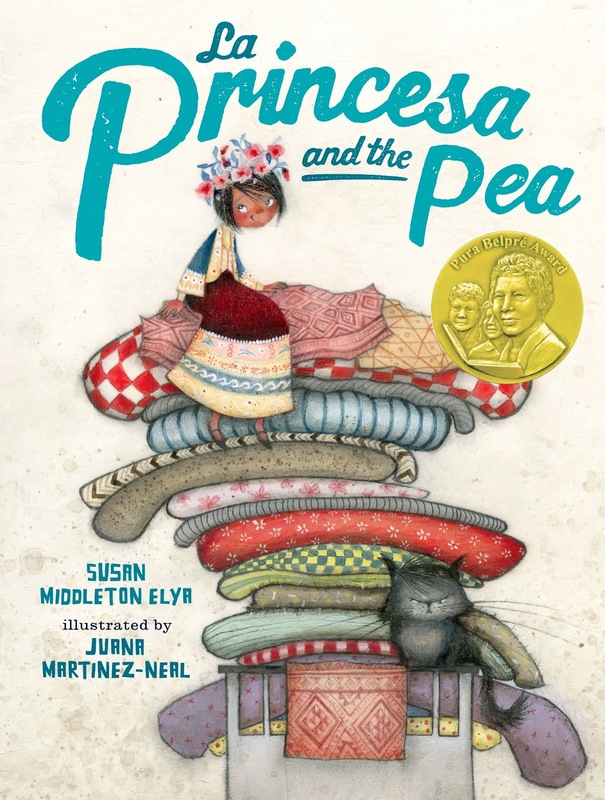 La Princessa and the Pea puts a Peruvian spin on Hans Christian Andersen's fairy tale.